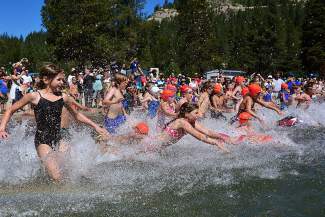 Children splash into the water at the start of the Donner Lake Kids Triathlon on Saturday. A total of 179 young triathletes finished. 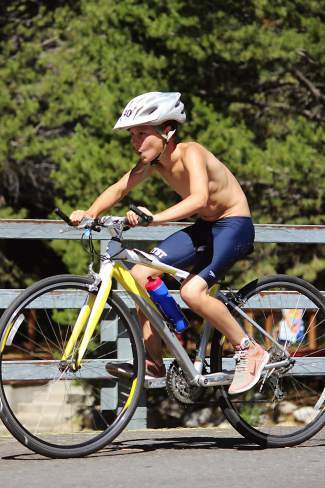 Diego Rodriguez of Truckee competes in the Kids 11-12 age group of the Donner Lake Triathlon. 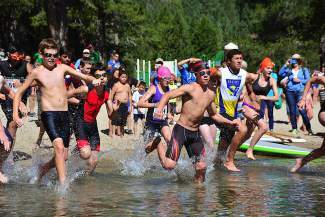 Participants in the Kids triathlon charge into the water at Donner Lake's West End Beach on Saturday. 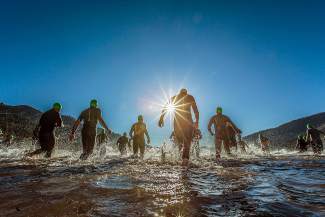 Athletes wade into the water off of West End Beach at the start of the Donner Lake Triathlon. 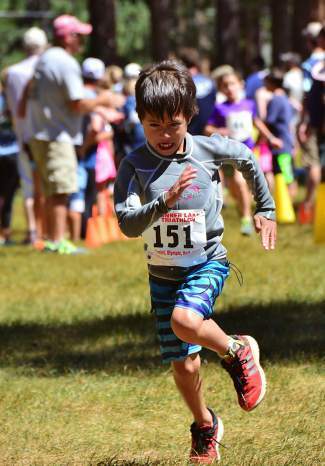 Jack Schrady of Truckee digs for the finish line during the Kids 9-10 race. 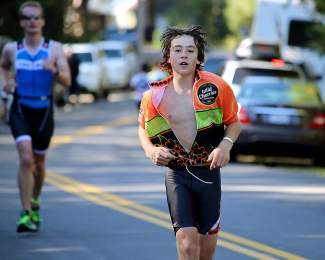 Truckee's Austin Bullock of the Wild Cherries Tri Team competes in the Sprint triathlon. He finished 37th. Clare Walton of Tahoe City heads out on the run during the Donner Lake Olympic Triathlon on Sunday. Walton finished fourth in the women's field. Peter Carroll of Truckee exits the water during the Donner Lake Sprint Triathlon on Saturday. Carroll finished fourth. 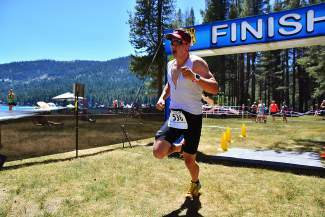 Truckee's Donatas Ereminas wins the half-Ironman distance event of the Donner Lake Triathlon on Sunday. Jessica Koltz of Truckee crosses Rainbow Bridge en route to her third-place finish among women. 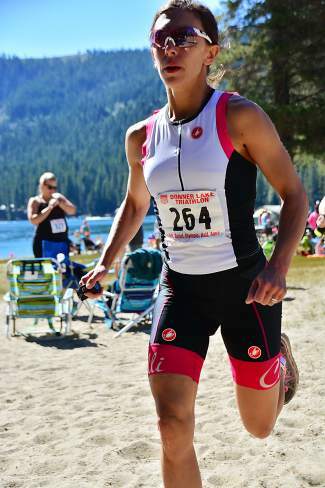 Shawna West of Truckee was feeling her oats near the end of the Olympic-distance Donner Lake Triathlon on Sunday. If there’s one athletic event that never lacks participation in the Truckee/Tahoe area, it’s the Donner Lake Triathlon. The 34th running was no exception. 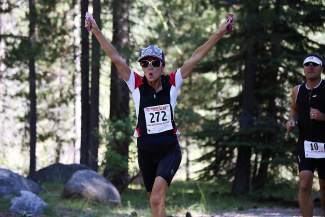 The historic triathlon, held this past Saturday and Sunday, attracted more than 800 athletes to Donner Lake’s West End Beach. 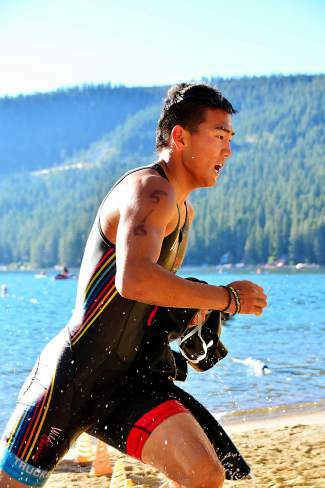 The weekend of racing began Saturday with the Sprint triathlon, the Truckee Open Water Swim and the Kids triathlon. It concluded Sunday with the Donner Lake Aquabike, the Half triathlon and the traditional Olympic triathlon. 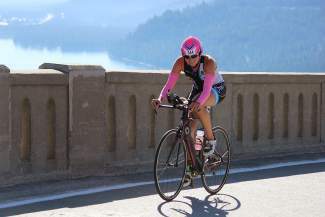 The Olympic triathlon sends competitors on a 1,500-meter swim in Donner Lake, a 24.8-mile bike ride up Old Highway 40 to Kingvale and back, and a 6.5-mile run around the lake. Scott Young, 49, of Reno raced to the overall victory in a field of 291 triathletes, crossing the finish in 2:18:26. Last year’s winner, J.P. Donovan of Incline Village, won it in 2:11:01. Young was followed by Derek Lewis of Denver, who finished in 2:21:26, and Michael Ingardia of San Jose rounding out the top three in 2:25:30. Incline Village resident Markham Gross, 41, was the top local finisher in 10th (2:31:15). Brianna Baird, a 17-year-old from San Francisco, placed first among a competitive women’s field and ninth overall in 2:30:52. Jennifer Todd of Newbury Park was the second woman and 20th overall (2:37:41). She was trailed by Truckee’s Jessica Koltz, who was 26th overall (2:42:14) and Clare Walton of Tahoe City, who was 28th overall (2:42:54). Last year’s women’s winner, local triathlete Anna Mae Flynn, won with a time of 2:40:42. Among other top local finishers, Dan Haas of Homewood was 27th (2:42:29) and Michael Bergin of Incline was 38th (2:48:03). The Half triathlon is the same distance as an Ironman 70.3, or half of an Ironman. That measures out to a 1.2-mile swim, a 56-mile bike and a 13-plus-mile run — or two laps around Donner Lake. In a close race to the finish, Truckee’s Donatas Ereminas edged Jacob Dodge of Dinuba for the win, posting a time of 4:41:51 to Dodge’s 4:41:54. Ereminas, who placed fifth last year, pumped both fists in celebration as he ran into the finish chute. Matthew Hofman, who traveled from McKinney, Texas, to compete, finished third in 4:53:48. 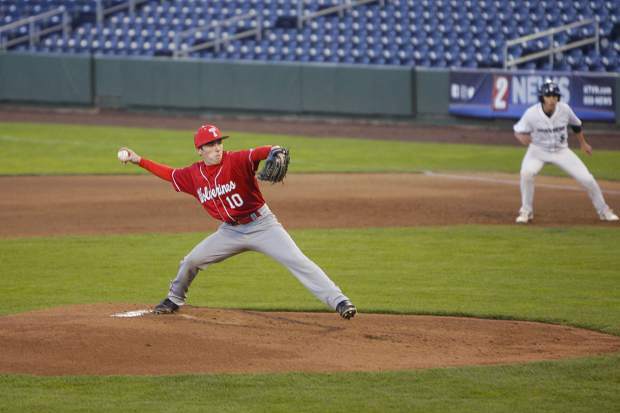 Former big league baseball player Eric Byrnes, meanwhile, placed sixth with a time of 5:11:02. Amy Thornquist, 42, of Sandy, Utah, raced to a top finish among women and placed seventh overall in 5:13:36. Janet Soule of Davis was the second woman and 28th overall in 5:53:47, and Kayla Coleman of Loudonville, Ohio, was the third woman and 33rd overall in 5:56:14. 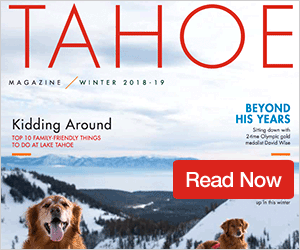 Locally, Truckee’s Jeff Schloss, who is preparing to compete in the Ironman Lake Tahoe in September, finished 15th (5:37:10), Joshua Wheeler of Truckee placed 24th (5:48:07), Adrian Trieslau of Tahoe Vista was 49th (6:20:26) and Victor Heredia of Incline Village was 50th (6:21:11). A total of 106 people reached the finish line. The Sprint triathlon — a quarter-mile swim, 6-mile bike and 2-mile run — was the most popular distance with 238 finishers. Matthew Balzer, 34, of Reno claimed the Sprint victory with a time of 38:41 and was followed by Timothy Winslow of Elk Grove (39:41) and longtime participant and former champion Michael Smith of Santa Barbara (41:18). 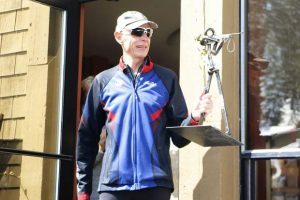 Truckee 18-year-old Peter Carroll was the top local, recording a fourth-place finish with a time of 42:47, while Jessica Koltz of Truckee captured the women’s win and finished ninth overall in 46:45. Kelli Kellerman of Redwood City was the second woman and 15th overall (49:55), and Carly Clusserath of Berkeley was third among women and 20th overall (50:15). 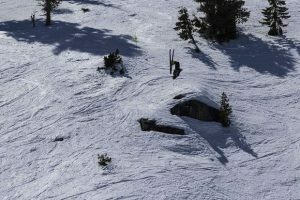 Truckee’s Shauna Althof was the fifth woman and 26th overall (51:45), and 15-year-old Ids Propstra of Truckee placed 21st (50:26).